I'm really excited to introduce to you the first indie polish of my collection. I bought three duochrome top coats (!!!) from Lilacquer, called Selkie, Lycanthrope and Kitsune. I'm a bit of a mythology/supernatural nerd, so I thought it was really cool that the polishes are named after mythological creatures. The one I'm showing you today is Selkie, which is my favourite of the three. From Wikipedia: Selkies are mythological creatures found in Faroese, Icelandic, Irish, and Scottish folklore. They are said to live as seals in the sea but shed their skin to become human on land. If a man steals a female selkie's skin she is in his power and is forced to become his wife. Female selkies are said to make excellent wives, but because their true home is the sea, they will often be seen gazing longingly at the ocean. If she finds her skin she will immediately return to her true home in the sea. 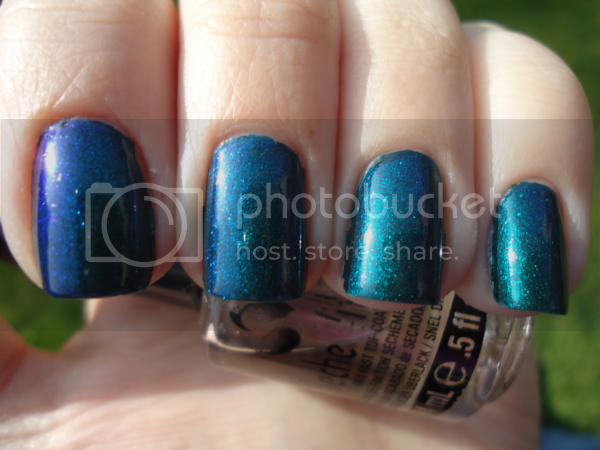 Lilacquer Selkie is a blue/teal/green duochrome shimmer top coat. 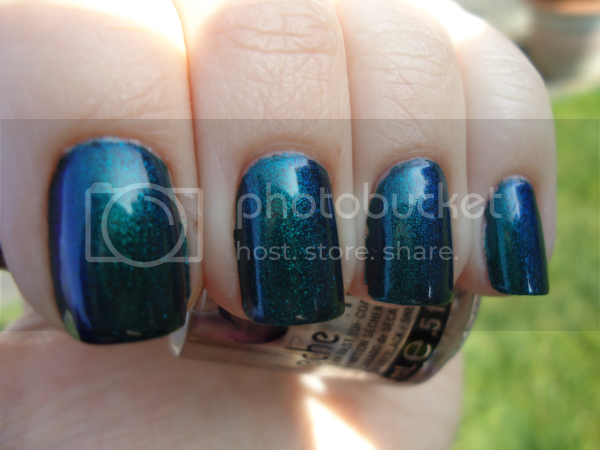 I used two coats of a dark teal, Nails Inc Blair, first, then two of Selkie. I was warned by the maker that I might find it a bit thick so I was prepared to use a bit of thinner, but actually I had no problems with it whatsoever. It went on perfectly. I took eleventy billion photos of this polish and a part of me wanted to post them all...but I managed to narrow it down a bit! Isn't it lush? It's even better in person. 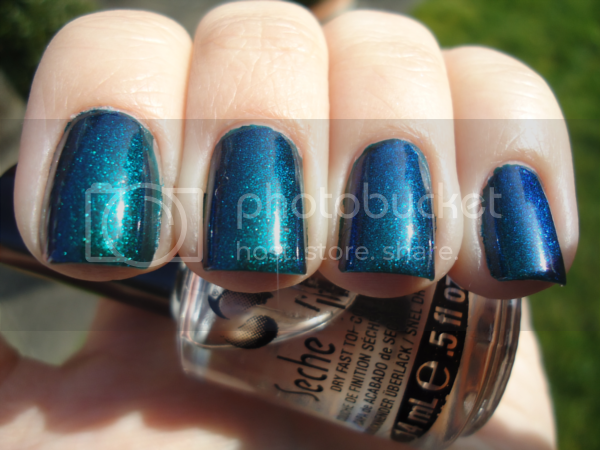 In the shade it's a pretty, deep blue shimmer, but when the sunlight hits it...blam! Sparklefest 2012. It's got such incredible depth to it, like looking into a pool of tropical water. 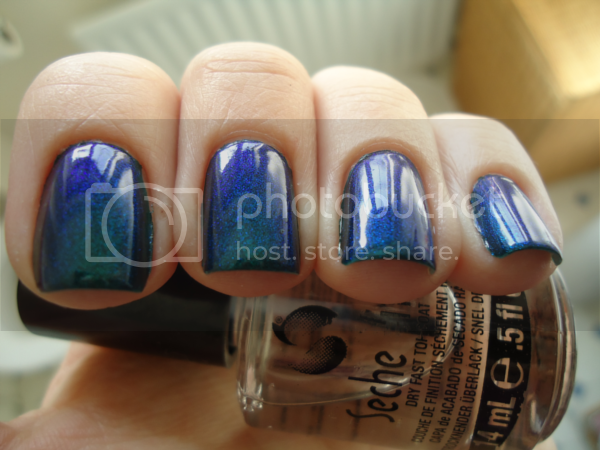 The duochrome is very noticeable, and the different colours really complement each other. This is what Models Own Emerald Black should have been like. Lilacquer Selkie retails for $6 (about £3.80) for 5ml. It's not an Etsy shop; to order you email the creater directly and pay by PayPal. International shipping is available at a very reasonable price, and delivery is quite fast - it took 10 days to reach me in the UK from the States. I'll be showing you the other two colours available very soon.